The accuracy of current vitamin D measurements by immunoassays and LCMS has been questioned due to the overlapping LC peaks with identical m/z values epimers and isobars. 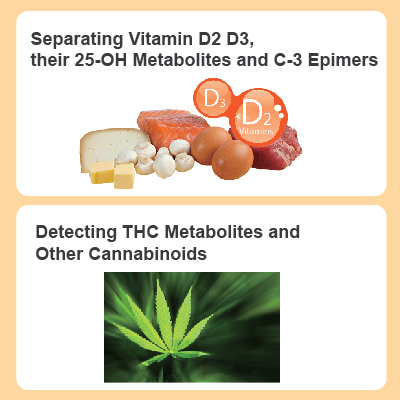 To solve this problem, we have developed a new HPLC method to achieve baseline separation of vitamin D2/D3, their 25-OH metabolites and C3-epimers in one single run. In the first part, Δ9-THC, 11-hydroxy-Δ9-THC and 11-nor-9-carboxy-Δ9-THC are detected using a simple gradient. In the second part, four cannabinoids, CBD, CBN, Δ9-THC, and Δ8-THC were baseline separated making quantification easy.